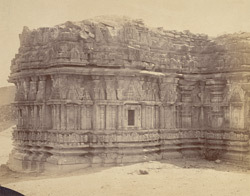 Photograph of the sanctuary façade of the Venugopalaswami Temple (locally known as Suryanarayana), from the south-west, taken by Henry Cousens around 1890. Magala is situated on the Tungabhadra River about midway between Hampi and Harihar. It has a very ornate though incomplete temple which was probably built in AD 1209, during the reign of the Hoysala King Ballala II, as suggested by an inscription. It consists of three sanctuaries around a central hall. The hall is open with screens with large square holes with a luxurious foliage decoration and has a small doorway. The parapet is decorated with miniatute temple towers and is covered by an overhanging eave. The walls are decorated with pilasters with towers covered by makara-toranas carved with great details. The sculptures in the niches on the outer walls, now almost all gone, represent mainly Shiva.